Welcome to the home page of Iain Culross. Iain, originally from Dundee in Scotland, has always had a passion for playing both cornet and trumpet. 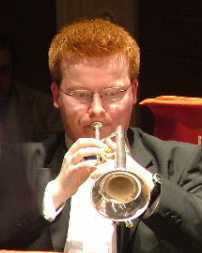 Iain currently plays principal cornet with Grimethorpe Colliery Band. Born in 1986, by the age of seventeen, Iain had already gained a second performing diploma with distinction and played principal cornet for several brass bands including Boness and Carriden Band, Clackmannan & District Brass Band, Tullis Russell Mills Band and Dundee Instrumental Band. He also holds a B.A. (Hons) degree in Music as well as an M.A. in Music Performance from Salford University. Iain has travelled internationally giving master classes and appearing as both guest soloist and conductor with various bands. He recently returned to Grimethorpe after a time with Leyland Band. Earlier appointments as a principal cornet player have been with the Fairey Band, Sellers International Band and YBS Band (now Hammonds Saltaire), as well as standing in at Carlton Main Frickley Colliery Band for the 2006 Yorkshire regional championship while Kirsty Abbots was on maternity leave. Before leaving Scotland to attend university, Iain played for Unison Kinneil Band based in Bo’ness. During his early years as a cornet player, Iain also played repiano cornet with Bon Accord Silver Band (Aberdeen) and the Scottish Co-op bands as well as being a member of the National Youth Brass Band of Scotland (NYBBS) main band since the age of eleven. His final couple of years with NYBBS were as principal cornet, his career there finishing on a high note with a tour of Japan. Now you’re here, have a look round the site – you’ll see there are links above to pages giving more details about Iain’s background, achievements and influences. Most of all, thanks for taking the time to stop by and visit this site!